Aiming for a respectable showing at the 2022 Winter Olympics, China is looking beyond its borders to recruit qualified hockey players with ancestral ties to the country. Zach Yuen, Brandon Yip and Brayden Jaw are three of the most prominent. They all hail from Vancouver, Canada, and are currently honing their talent with Shanghai-based Kunlun Red Star, China's lone entry in Russia's professional Kontinental Hockey League. "My biggest goal is to play for China's national team at the 2022 Winter Games," Yuen, a 25-year-old defenseman, said in a recent interview with Tencent Sports. "To reach that goal, I have to improve myself and keep pushing myself every single day." Since becoming the first player of Chinese descent to sign with Red Star when the team was founded two years ago, Yuen has studied Mandarin and spends the offseason traveling the country and experiencing the culture. His love of China is a result of his father's influence. "I came to Canada when I was very young, but I always consider myself Chinese," said Yuen's father, Yuen Zhiliang, who gave up his career to support his son and help two Chinese women's teams get into the Canadian Women's Hockey League. "I always tell my son that although you were born in the North America, you've got a Chinese face and you are Chinese." 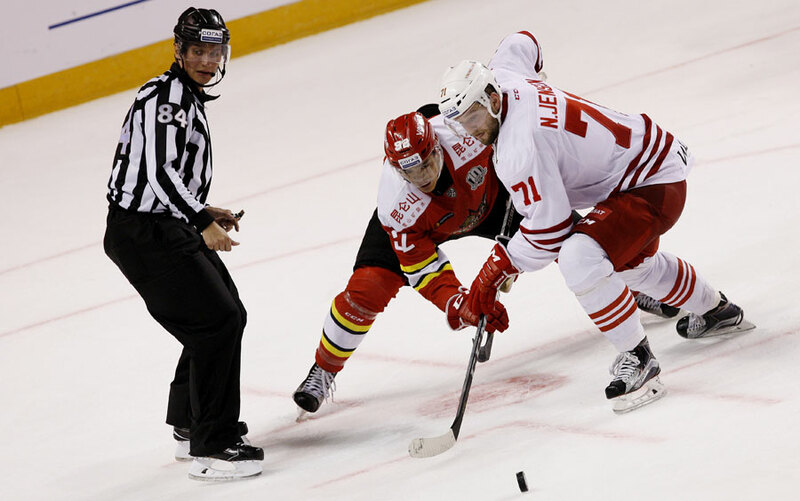 Yip, a 32-year-old forward who scored 29 goals and 56 points in 174 NHL games with the Colorado Avalanche, Nashville Predators and Arizona Coyotes, has notched 18 points in 48 games with Red Star this season. Jaw, a 6-foot-3 defenseman, signed with Red Star after graduating from Harvard and dabbling in investment banking on Wall Street. Team China is not limiting its recruitment to established pros. Ty Schultz, coming off three seasons with the Medicine Hat Tigers in the amateur Western Hockey League, said he's willing to give up his Canadian citizenship to play here. "If Canadian players can join the South Korean team, then as a guy of Chinese descent who can speak Chinese, I want to go to China play," Schultz told Tencent Sports after South Korea, augmented by six Canadians, qualified for last month's Pyeongchang Winter Games. With a Chinese mother and a German dad, the 21-year-old defenseman was born in Canada. In 1975 his grandmother, Zheng Fengrong, became the first female Chinese athlete to own a world record when she set the high jump mark with a leap of 1.77 meters. Deeply influenced by his grandmother's athletic prowess, Schultz learned to skate when he was 3 years old and, like most Canadian kids, started playing hockey at 5. In 2007, he starred for a Beijing youth team that won an international tournament at the Bell Center in Montreal. That was the first time Schultz suited up for China and he proudly recalls posing for a team photo in front of the Chinese national flag. Organized by Beijing Municipal Sports Bureau and Beijing Hockey Association, the capital's current youth league has attracted a record 2,554 children on 162 teams. Those are impressive numbers－but still a long way from assuring a homegrown team will compete at the 2022 Games. "We'd love to see Chinese teams at the 2022 tournament, but we also have to ensure the world-class quality of the Olympics won't be compromised, which is always the priority," said Thomas Wu, International Ice Hockey Federation vice-president. "The gap between Team China and the world hockey powers is still quite big, so the most urgent need for China is to improve the competitiveness of its program as fast as possible." Pipeline for China's hockey future goes through Canada.